Registration of the journal. Number of the certificate on mass media registration: ПИ №ФС77-58109 20.05.2014. Registration in the International center ISSN 2074-9120 15.06.2009. About observance of publishing ethics. According to the international norms accepted by the leading scientific publishing houses, the journal editorial board has approved the ethical principles which observance is obligatory for all participants of the process of scientific publication - authors, members of editorial board, reviewers, chief editors and the publisher. 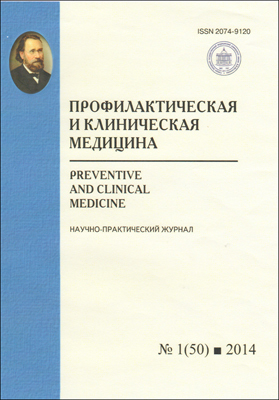 - formation of the scientific-information media, exchange of scientific data between members of world medical scientific community, attraction attention to the most actual, perspective and interesting directions in preventive and clinical medicine, exchange of opinions between researchers from different regions and states. Editorial board of the journal pursues a policy of open access to the reviewed electronic scientific publications, promoting improvement of scientific information exchange, and also increase of citing of works and, accordingly, productivity of scientific activity of the authors published in the journal.